The redesigned heavy-duty GMC pickups trucks arrive later this year. Chevrolet revealed the 2020 Silverado HD in December, and let’s just say not everyone was a fan of the new look, especially the gaping grille on certain models. Now, GMC has released a teaser for the new Sierra HD, and we’re not quite sure what to think. 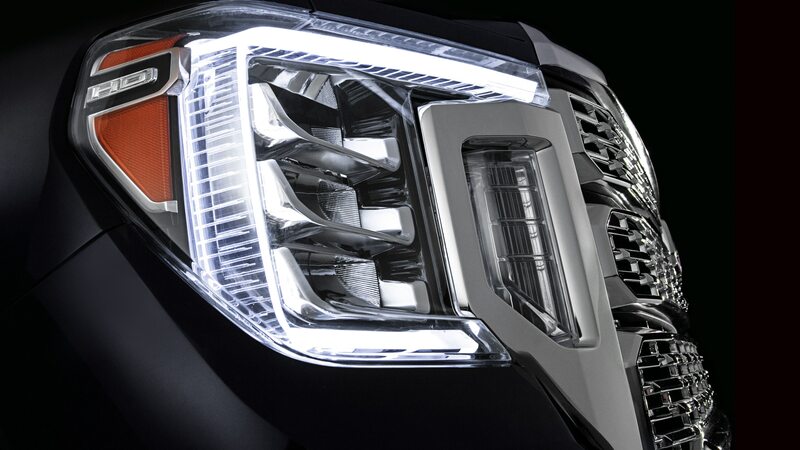 From this teaser image, we know one thing’s for sure: It’s going to be huge like that of the truck’s Chevrolet sibling. The version pictured here is the uplevel Denali, which explains the copious amounts of chrome. The headlights look sharp, but we’re not sure how they will look in conjunction with the element that separates them from the grille. We’ll reserve our final judgment until we see the truck in full, of course, because we’re polite like that. Expect engine choices to mirror those on the new Silverado HD, although GM has yet to release full powertrain details. We do know it will receive a direct-injected engine, and that this unit is to be paired with a six-speed automatic transmission and is rumored to be a Navistar-sourced 6.6-liter V-8 from MD Trucks. The other engine option will be a Duramax turbodiesel V-8 that delivers 910 lb-ft of torque. That engine will come hooked to a 10-speed Allison automatic. The 2020 GMC Sierra Denali HD will reach dealers in the second half of 2019, so we expect a full unveil soon. The AT4 Off-Road package is added to the lineup, too. Ten years have passed since the Mini nameplate was resurrected as BMW’s compact sub-brand.